FIRST is pleased to announce the addition of Splunk and eBay to the 2013 Sponsorship Team! Both Splunk and eBay have joined at the Gold level. We look forward to seeing them at the conference! Wed, 13 Mar 2013 : : Welcome back Citi! FIRST is honored to announce that Citi has rejoined the conference sponsorship team as a Platinum sponsor! Citi has been a sponsor of the annual conference since 2000! 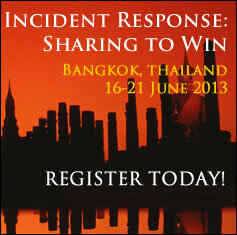 Thank you Citi for your continued support of the Incident Response community. Wed, 06 Mar 2013 : : Draft Agenda is Available! FIRST 2013 draft agenda is available for viewing! Please note that our speakers are in the process of confirming their participation. Updates to the agenda will be made as they become available. Mon, 04 Mar 2013 : : Welcome back Sponsors Secunia & Lancope! Big welcome back to Gold Sponsor Secunia! Secunia has been a conference sponsor since 2009 Kyoto. Secunia will be exhibiting starting Tuesday at the Vendor Showcase. We'd also like to welcome back Lancope as an exhibitor! Lancope has been participating at the annual conference since 2011 Vienna. Thank you to both organizations - we look forward to seeing you both in Bangkok! FIRST would like to welcome back Solera Networks to the Sponsorship Team. Solera will be exhibiting at the conference in addition to sponsoring our Sunday night kick-off Ice Breaker event. Wed, 06 Feb 2013 : : Welcome 2013 Gold Sponsors! WOW - we are very excited to have several vendor sponsors join us at the Gold level for FIRST2013! Thank you to General Dynamics - Fidelis Cybersecurity Solutions, FireEye and Verint for joining the FIRST Sponsorship Team. We should have an amazing Vendor Showcase for attendees Tuesday evening of conference. Notification of acceptances have been delayed until the week of 25th February. If you have any questions or concerns, please contact us at first-2013@first.org. Thank you. Tue, 27 Nov 2012 : : Call for Speakers! Don't miss your opportunity to be a part of the 25th Annual FIRST Conference! Check out the official Call for Speakers and fill out our submission form by Friday, December 7th! Send us an email at first-2013@first.org.